“Yars’ Revenge” by John GreenIt can be easy to write a story or make a comic that is full of references to pop culture. It’s often a cheap tactic, or even a crutch, to crack a joke about something everyone is familiar with to make sure you get a laugh. But while Astronaut Academy is full of textual and visual nods to popular toys, music, and video games, there’s nothing at all cheap about how Dave uses them. Dave weaves together these references in a way that creates a living, breathing world. They are the building blocks of the Astronaut Academy universe, establishing its rules, its physics, its limitations, and possibilities. They are not a winking, self-conscious commentary on the TV show or action figure line Dave has plucked them from, but part of the story’s (and Dave’s, I’d say) DNA. Many of the references, particularly to video games, are easy to trace back to their source, such as the kids having Legend of Zelda-style heart meters or the Principal’s Final Fantasy-inspired sword. But what’s more impressive are the obscure, subtle homages. Take “Yars’ Revenge.” Dave plunged the depths of his deep, deep mind for this one. 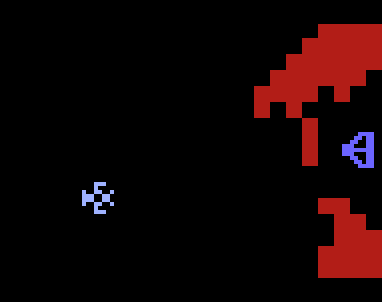 “Yars’ Revenge” came out in 1982 for the cartridge-based 8-bit Atari 2600. For anyone who didn’t understand anything in that sentence, it was an old video game for an old video game console. It was Atari’s best selling original title for the system, and I have fond memories of playing it as a kid. Despite it’s popularity three decades ago, and even a few recent remakes, I don’t think the name “Yars’ Revenge” has ever really entered the public consciousness. In all likelihood, someone hearing the “Yar” in the title might think it has something to do with pirates. In actuality, a Yar is a space insect. This is the part about “Yars’ Revenge” that I loved the most. Sure, the game was actually fun to play, but what is fascinating is that it had this in depth narrative to it. You played a Yar, and you were avenging the destruction of your planet, Razak IV, by the evil Qotile. 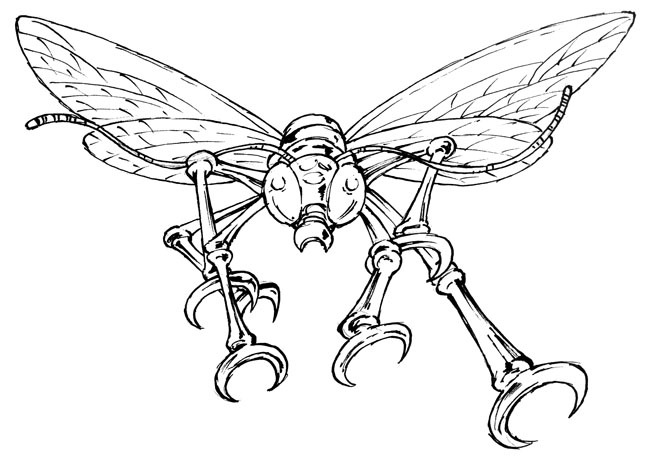 The Qotile was surrounded by a barrier, which you (as an insect Yar) could slowly eat through or shoot through with your Zorlon cannon. The Qotile could shoot back, but there was a neutral zone where you couldn’t shoot or be shot, unless the Qotile turned into the dangerous Swirl. So what does “Yars’ Revenge” have to do with Astronaut Academy? As it turns out, it’s one of the inspirations of the popular lacrosse-like sport Fireball. 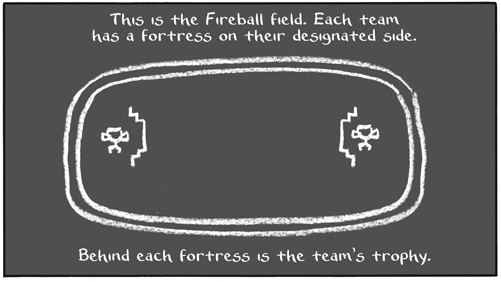 In Fireball each team has a destructible barrier the opposing players have to shoot through, much like the Qotile’s barrier. Even the Fireball trophies (as seen on page 84 in book 1) look inspired by a Yars’ limb (according to the box art.) And even still, when *spoiler* Tak Offsky explains Fireball to Hakata Soy, the chalk diagram of the field is similar to the 8-bit look of the video game. 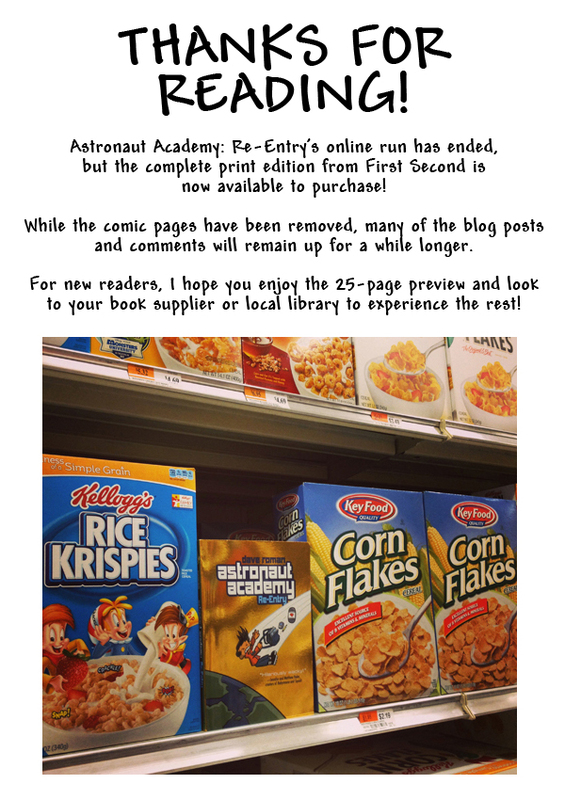 There probably aren’t many in or outside Astronaut Academy’s target demographic who would notice these connections to a more than thirty-year-old video game. And still, getting the reference isn’t the point, or even really Dave’s goal. It’s his love and reverence for these elements from his youth (and sometimes not-so-youth) that compels him to build his own worlds out of them, and also what make them transcend just being pop culture references. Now, if only someone will make a Fireball video game, we’ll have really come full circle. John Green has known Dave Roman for half his life and they’ve been making comics together that whole time. Together Dave writes and John draws Jax Epoch and the Quicken Forbidden and Teen Boat! John also creates the minicomic Space Office, does video game art and design, and often draws Phineas and Ferb comics and picture books for Disney. Visit his website! Ah HA! The Heart-Breaker is stealing more hearts! The plot thickens! It would be great if you could keep the apostrophe in the name in the right place. I mean, it’s only in the cartridge image you used. 😉 It’s Yars’ not Yar’s.